While no one believes that you can do things to turn your child into Einstein, believe it or not there are things that parents can do to help their children use their brains to the best of their abilities. Tips you can use to raise smarter kids. That is actually the whole point. You’ll notice that most of these tips involve doing activities which will engage different parts of their brain – thereby, giving each part of their brain practice or exercise. Sing a song and/or play music. Do not steer away from the classics, but change it up with popular music and kids tunes. The rhythm in the music is something that has been proven to help children learn math in later years. Turn off the television. While there are shows that help kids learn, the act of watching television relaxing the brain and does not allow it to fully take in a lesson like reading a book where you have got to imagine the story and what the characters look like. Make sure your children are getting enough sleep. Busy mums know how hard it is to get the kids to bed on time when you are working and then running to different activities all throughout the week. But the physical body of a child needs its rest to grow, as it grows while the child is sleeping. Not to mention your kids need to recharge to put their best foot forward in the new day. Provide interesting books for your child to read – and continue to read to them. Just because your kids learn how to read, doesn’t mean they stopped wanting to hear a good story. Take your kids to a library or books store and allow them to pick and choose the topics they want to read about. Ask the children’s librarian to help your child pick out a book. As a professional, they will know how to gage your child’s reading level and give them the perfect book that fits their reading ability and interest. Give your kids responsibilities and chores. When someone is given a responsibility they learn to use their abilities to accomplish the task. This helps them gain confidence and your child will want to continue doing more and learning more. Give your child lots of outdoor play time. Studies have shown, when kids get outside to play in an unstructured way, their ability to be creative and problem solve skyrockets! And what better way to interest them in hours and hours of outdoor play than with one of our excellent backyard cubby houses. The Country Cottage cubby house is an elevated play house design with a veranda and an upper-level deck, making this cubby one of our larger cubbies at 4200 x 3000mm. It is durable, safe, and will stand up well to all kinds of weather. 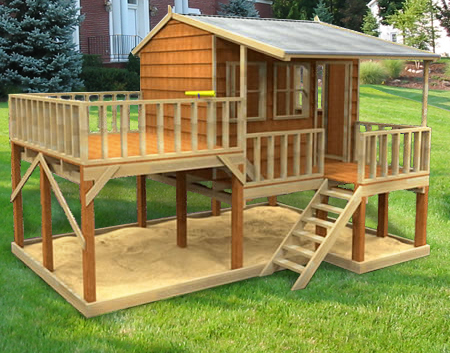 The sand pit under the cubby will keep your children cool while creating worlds of fun in the sand. Most of all, it is a place where your kids will love to use their imaginations, play, and grow. And you can feel safe because they are in their own backyards.